Electronic Olfactory System (EOS) sensor technology is widely used in both research and industry to provide olfactory data for analysis. A variety of physical sensor types exist, each gathering olfactory data in a unique way, and each with individual performance gains and losses. This data has allowed the development of robotic platforms that utilize a variety of algorithms to locate and navigate to the sources of odor plumes in experimental environments. Most of these systems utilize chemotaxis, which allows effective navigation only in ideal, non-turbid environments due to both plume dynamics and limitations in response and recovery times of available artificial olfactory sensors. This paper discusses the implementation of a preprocessing algorithm that examines local data minima and maxima, and the use of the resultant transient sensor response data to successfully locate odor sources. The algorithm interprets earlier work with preprocessing algorithms for chemosensory data on other EOS sensor types and successfully implements this algorithm to achieve chemotaxis-based navigation onboard a mobile robotic platform. Preprocessing of this type decreases effective sensor return time of NASA's Jet Propulsion Laboratories ENose to approximately four hundred milliseconds; a return time comparable to that of a biological system, and representing an eighty-four percent decrease in effective sensor return time compared to threshold based systems. Multiple trials were run to obtain data, and all data were analyzed using paired t-tests. Results of analysis indicated that all data had a high level of statistical significance. This measurable increase in effective performance lays the groundwork for sensors of this type to be used in volatile, real-world environments with new navigation algorithms for odor source localization. Many studies implementing mobile odor source localization systems, typically mobile robots utilizing a gas sensor or sensors, have been published in the past decade (Lilienthal & Duckett 2003, Lilienthal et al. 2001, and Loutfi & Coradeschi 2002). Olfaction-based navigation is an alluring goal for robotics, as it would allow the replacement of the costly biological systems that are currently in place. These biological systems are either extremely limited in their effective lifetime of use or require high training costs, such as the hard-wired moths for explosives detection in King et al. (2004) or bomb-sniffing canines, respectively. These robotic systems could be used for such varied tasks as bomb or drug detection, gas leak detection/localization or pipe inspections in controlled systems (Duckett et al. 2001, Russel et al. 2003). Previous studies, however, have mostly assumed controlled laboratory conditions as the relevant environment and few researchers have attempted algorithm design robust enough for use in conditions with the dynamism and volatility of real-world odor plumes. Turbulence and associated plume intermittency is recognized as a significant challenge in robotic localization of an odor plume's source (Duckett et al. 2001). While attempts have been made at designing systems for use with volatile odor plumes, the majority of these studies have not progressed past theory or simulation stages (Keats et al. 2007, Jatmiko et al. 2007, Jatmiko et al. 2006, and Vergassola et al. 2007). These studies are an excellent start, but most require multiple robots or simulated agents, complex equations that are unrealistic for efficient implementation onboard many available microcontroller platforms, or unrealistic sensor response or return time requirements. Sensors and their associated data processing algorithms currently have insufficient temporal resolution to accurately map odor field dynamics, a necessary capability for navigating a dynamic odor plume with current systems. Vergassola et al. (2007) proposed an algorithm known as Infotaxis to help avoid many of the issues associated with current olfactory navigation algorithms. While Vergassola et al. (2007) only implemented a simulated system, their algorithm touches upon key ideas for efficient odor plume navigation in a turbulent environment. Many previous studies have utilized simple chemical gradient following algorithms, but Vergassola et al. (2007) proposes navigation by local information gradients and utilizes the intermittency of odor in a turbulent plume to achieve this end. Turbulent odor plumes generate intermittent patches or filaments of odor and of comparatively odorless air (Webster et al. 2001). The ratio of odor patch to odorless patch, known as the intermittency of the plume, decreases with distance both from the odor source and the centerline of the plume (Webster et al. 2001). In a simple chemotactic algorithm with the low temporal sensitivity that current hardware use dictates, plume intermittency can cause problems such as loss of the plume being navigated, resulting in algorithmic, and thus, navigational failure. Even in relatively controlled environments where minimal plume dynamics are present, chemotaxis algorithms experience challenges when attempting to effectively navigate to an odor source. These challenges are partially due to the inability of current sensors to respond quickly to local changes in concentration resulting in false odor detection or loss events that confuse the operation of navigation algorithms. The algorithm proposed in Vergassola et al. (2007) requires nearly instantaneous detection of the patches of odor and odorless air in order for appropriate navigation to occur  this, however, is beyond the physical limitations of current gas sensors when used in a traditional manner. Commercially available gas sensors have a return time (the time required for the sensor reading to return to its baseline) of up to 40 seconds. Comparatively, insect olfactory systems recover in 660 milliseconds or less (Harvey et al. 2006). Semiconductor gas sensors and polymer-based gas sensors are two of the most commonly available sensor types. This study uses Jet Propulsion Laboratory's ENose polymer-based gas sensor. The JPL ENose sensor uses a polymer with eight carbon-doped pixels. When an odor in the air interacts with a sensor pixel the polymer swells or retracts and the resistance across the circuit falls or rises (Shevade et al. 2005, Ryan et al. 2004). In order for JPL's ENose to return to baseline, the odor molecules causing the polymer to swell must detach from the polymer and diffuse into the surrounding air. This lengthy process can take up to 40 seconds in polymer-based gas sensors (Harvey et al., 2006). This large sensor recovery time is one of the major limiting factors in how effectively real-time olfactory-based navigation systems can operate. Ishida et al. (2005) report on the implementation of a signal processing system that was demonstrated to improve the functionality of semiconductor gas sensors with a lengthy return period. Most systems utilize a threshold value to isolate sensor response spikes. When a signal exceeds the threshold the sensor is deemed to be detecting an odor, and when the signal falls below the threshold it is judged to be clear of the odor. Ishida et al. (2005) implemented a signal processing system that examines the differential of local minima and maxima in a sensor data set. This approach allowed the detection of sensor responses to odor or the lack of odor much faster than previous systems because it detects the slope of a signal wave rather than an absolute value in reference to a static threshold. This study implements an odor plume navigation algorithm utilizing key ideas from Ishida et al. (2005). By processing the signal in a manner inspired by that discussed in Ishida et al. (2005) the temporal resolution of JPL's ENose polymer-based gas sensor can be improved to a level comparable to that of biological systems, thus allowing effective navigation. A significant decrease in effective sensor return times through data preprocessing will allow the implementation of new navigation algorithms such as proposed by Vergassola et al. (2007) without significant advances in EOS hardware capabilities. Data is sampled from the sensor (Figure 1, item 1) at a rate of 1000 samples/second by the onboard microcontroller (Figure 1, item 2). The microcontroller performs an analog-to-digital conversion and feeds the data into the navigation algorithm (Figure 1, item 3). The navigation algorithm consists of two main logical modules - Data Preprocessing (Figure 1, item 4) and Plume Navigation (Figure 1, item 6). The data preprocessing module accrues samples for a 50ms period and computes local averages over 5ms ranges, storing the result locally. Ten individual 5ms averages, representative of the sensor response curve for a discrete 50ms period are computed in this manner and the resultant array is sorted by acquisition time. Local minimum and maximum values are determined and local change is calculated using minimum, maximum, and acquisition time data (Figure 1, item 5). The values from this local waveform analysis are passed to a basic chemotactic navigation function (Figure 1, item 6). Navigation is simple and relies on local perceived maxima and minima of data  accepting inputs of relative percentages and percent change data from the data preprocessing system, the navigation algorithm compares sensor values for given positions in direct proximity to the robot, determining a local concentration map (Figure 1, item 7). The algorithm then directs the robot to orient in the direction of the local odor maximum and to move forward until an object is detected by proximity sensors or until a negative signal slope  representing a decrease in sensed odor  occurs with a magnitude of greater than 15%. (Figure 1, item 8). The whole system operates in perpetuity until the robot reaches a location at which the sensor exceeds a predetermined threshold value  representing the odorant point source. Figure 1: Schematic of algorithm information flow. Data is collected by the sensor array (1) and passed to the onboard microcontroller (2). The navigation algorithm (3) runs on the onboard microcontroller (2). The navigation algorithm consists of a data preprocessing algorithm (4) and a plume navigation algorithm (6). The data processing algorithm performs local min/max analysis (5) over 50ms to determine the local slope of the sensor wave. The local slope is passed to the plume navigation algorithm (6). Navigation considers odor concentration as determined by local slopes (7) and employs tracking rules to locate the source (8). The navigation algorithm (3), after processing the sensor data, outputs motor commands to the microcontroller (2). Chemotaxis navigation using sensor data preprocessing methods as described above were implemented onboard a mobile robotic platform for testing purposes. The mobile platform consisted of four-wheeled vehicle constructed using Lego Mindstorms as a quick-prototyping system (The Lego Group). Two nine-volt Lego Mindstorms motors provided locomotive force and all computational processes were run on an onboard, commercially available, microprocessor system known as the Handyboard (Gleason Research). Two Lego Mindstorms light sensors (The Lego Group) were used for object detection and avoidance. These two sensors, along with a single JPL ENose (Jet Propulsion Laboratory) comprised the total sensor array of the robotic platform. The ENose was mounted inside a metal Flow Regulating Enclosure utilizing a small, five-volt fan and a honeycomb system to create laminar airflow over the JPL ENose's reactive surface (Radioshack). Sensor Recovery Time: This experiment tested efficacy of the sensor data-preprocessing algorithm utilized for navigation. Two scripts were written in Interactive C and run on the Handyboard. Script 1 is the preprocessing algorithm referenced in The first script waits for a sensor input of zero, representing odor saturation, counts down from five, and then begins a timing process. The timer runs as the preprocessing system samples data and outputs percent changes. When a percent change in voltage  representing a reduction in odor  of a magnitude greater than fifteen percent is sensed, the script halts and outputs the current measured return time in milliseconds. The second script operates similarly, however it replaces the data-preprocessing system with a simple measurement and comparison to a baseline, odor-free reading. This system is considered to have returned to baseline when it reaches a value within thirty units of baseline  twelve percent of the total possible range and a high enough threshold to account for sensor noise. To collect data, a sample of 99% R-Limonene is placed in close proximity to the Flow Regulating Enclosure containing the sensor, saturating the sensor. This sample is removed when the countdown reaches one second. The sensor is then allowed to run in the comparatively low-odor laboratory air until a return time is output by the Handyboard. This data is then recorded for analysis purposes. Data is processed using a paired t-test. Source Localization: The robot and the odor source (a petri dish with 1.0ml of 99% R-Limonene) were randomly placed in a walled four by eight foot test environment. A distance of at least 48 inches was maintained between the starting positions of the robot and the odor source. The robot's initial heading was also random. The environment was left open to the airflow of the room, including that of an active air-conditioning vent directly over the test environment. Ten experimental trials were conducted with a maximum trial length of five minutes. Success was defined as locating the source within the trial time, and failure as not locating the source within the trial time. Success and failure rate was recorded. To control for the possibility of random and complete search of the test environment within the given trial time, ten control trials were run. The ten control trials used the same robotic platform, but a random number generator was used in lieu of sensor data. Success and failure definitions were identical to those in the ten experimental trials, and data recording was performed in the same manner. Data is processed using a paired t-test. Sensor Recovery Time: Twenty sensor recovery time trials were run, the results of which demonstrate a clear decrease in effective sensor return time when using the implemented preprocessing system. Figure 2 shows the average sensor return time from preprocessing trials was 420 milliseconds, as opposed to 2564 milliseconds in a threshold-based system. The preprocessing trials in Figure 2 showed a standard error of 98 milliseconds and the threshold-based system showed a standard error of 243 milliseconds. The p-value for this data was .0001. Figure 2: Sensor recovery (return) time in milliseconds for Preprocessing and Threshold based systems. The Preprocessing system has a mean return time of 420 milliseconds, as compared to the Threshold-based system with a mean return time of 2564 milliseconds. Error bars represent standard error in milliseconds as determined by a paired t-test. P-value for this data is .0001, demonstrating a high level of statistical significance. Source Localization: Ten source localization trials were completed, as were ten control trials for the source localization experiment. Figure 3 shows that an 80% rate of successful navigation to an odor source was recorded in experimental trials where olfactory cues were present, as compared to a 10% rate of successful navigation in control trials where no olfactory cues influenced navigation. A standard error of 13% is shown for experimental trials and an error of 10% shown for control trials in Figure 3. The p-value for the analyzed data was .0013. The purpose of this study is the implementation and validation of a sensor data-preprocessing system as a solution to current hardware limitations in artificial olfactory systems. The results presented above, while small in sample size, suggest a significant performance gain when utilizing the nonstandard data preprocessing system that was created and implemented in this study, as well as suggesting the validity of using the subsequent output of a preprocessing system to successfully navigate an odor field. The results presented in Figure 2 demonstrate a significant reduction in sensor return time from an average of 2564 milliseconds when a traditional threshold-based system was used, to an effective return time of 420 milliseconds when the preprocessing algorithm was implemented. This represents an 84% reduction in detection time for the removal of an odor source or the loss of an odor plume, and significantly increases the abilities of a polymer-based gas sensor with a slow return time, such as the sensor technology provided by JPL, for use in olfactory-driven navigational systems. With a p-value of .0001, the statistical value of the data is high and suggests that in the future, significant performance gains can be generated using a similar system. The ability to accurately map the real time dynamics of a volatile odor plume was previously lacking in this sensor, with a temporal resolution of approximately 2.5 seconds being the maximum obtainable when our sensors were used with a traditional data processing system. The preprocessing system implemented provides a maximum temporal resolution for our sensor of about 420 milliseconds. This temporal resolution is better than those of many biological olfactory systems including that of the silkworm moth, an organism on whose behaviors olfactory navigation algorithms are frequently based (Harvey et al. 2006). This preprocessing system was used to create a mobile, robotic, chemonavigation system using JPL's ENose sensor. Ten trials were run on the mobile robotic platform using a single pixel of a single ENose as its sole navigational apparatus. Future possibilities for improving performance include the physical separation of multiple sensors, or full use of an 8-pixel array, to improve navigational resolution. Figure 3 shows an 80% rate of successful navigation from start point to odor source when an odorous source was present. Also shown is that control trials (in which a petri dish with no odor was considered the source) showed only a 10% rate of successful navigation. The p-value of this data was .0013, suggesting a high level of statistical significance in the observed values. The 70% mean differential between experimental and control successes in the navigation trials, as shown in Figure 3, demonstrates the validity of using the data outputs of the preprocessing system in navigating a dynamic odor field. The ability to perform source localization via chemotaxis-based navigation with this particular sensor array was previously limited by the temporal limits placed on system response by sensor return times. Additionally, the high rate of successful navigation observed, when combined with the decrease in effective sensor return times, holds promise for future work in mobile autonomous robotic systems that integrate artificial olfaction with this particular sensor. Figure 3: Source localization success by percent across for experimental and control trials. 80% successful navigation was observed in experimental trials as compared to 10% successful navigation in control trials. 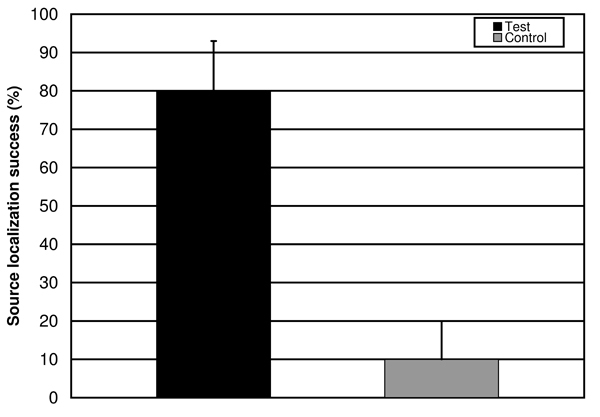 Error bars represent standard error in percent as determined by a paired t-test. P-value for recorded data was .0013, corresponding to a high level of statistical significance. Olfactory sensors will hold a vital place in robotics research in coming years, and a variety of systems will have to be developed that maximize the performance of available hardware. Preprocessing algorithms such as the one authored and implemented in this study will be vital to appropriately maximizing sensor data acquisition and use  extending the useful life of electronic nose hardware. While this algorithm is designed specifically for JPL's ENose polymer-based gas sensor, it suggests a point from which future researchers can begin their design of algorithms to extract maximum information from sensors that still fall short of biological counterparts. By narrowing the gap between manmade hardware and biology, algorithms such as the one presented in this paper will allow the integration of identification and navigation in single platforms  a useful combination for many olfaction-based tasks, and a necessary advance if robotic systems are to replace the biological ones currently in use. I sincerely appreciate the support of the National Science Foundation, Department of Defense, Lehigh University, and the Pennsylvania Infrastructure Technology Alliance that made this research and program possible. Additional thanks are due to NASA and Jet Propulsion Laboratories for their collaboration on this research and their provision of polymer-based ENose gas sensors for testing purposes. Finally, I would like to thank Dr. Duke Perreira, Dr. Jennifer Swann, and Anthony Dzaba for their guidance and support during the 2007 Lehigh University/NSF Research Experience for Undergraduates: "Animal-Like, Sensor-Based Robot Motions: Learning From Nature"
Duckett, T. et al. (2001) Learning to Locate an Odour with a Mobile Robot. Proceedings of the 2001 IEEE International Conference on Robotics and Automation , 4017-4022. Harvey, D. et al. (2006) Odor Sensor Requirements for an Insect Inspired Plume Tracking Mobile Robot. Proceedings of the 2006 IEEE International Conference on Robotics and Biomimetics, 130-135. Ishida, H. et al. (2005) Controlling a Gas/Odor Plume-Tracking Robot based on Transient Responses of Gas Sensors. IEEE Sensors Journal 5, 537-545. Jatmiko, W. et al. (2007) A PSO-Based Mobile Robot for Odor Source Localization in Dynamic Advection-Diffusion with Obstacles Environment. IEEE Computational Intelligence Magazine, 37-51. Jatmiko, W. et al. (2006) A Mobile Robots PSO-Based for Odor Source Localization in Extreme Dynamic Advection-Diffusion Environment with Obstacle. IEEE Sensors 2006, EXCO, 526-529. Keats, A. et al. (2007) Bayesian inference for source determination with applications to a complex urban environment . Atmospheric Environment 41, 465-479. Lilienthal, A. et al. (2001) Sensing Odour Sources in Indoor Environments Without a Constant Airflow by Mobile Robot. Proceedings of the 2001 IEEE International Conference on Robotics and Automation, 4005-4010. Lilienthal, A., and T Duckett. (2003) A Stereo Electronic Nose for a Mobile Inspection Robot. 1st International Workshop on Robotic Sensing, 1-6. Loutfi, A., and S. Coradeschi. (2002) Relying on an Electronic Nose for Odor Localization. VIMS2002 International Symposium on Virtual and Intelligent Measurement Systems, 42-50. Russell, R. A. et al. (2003) A Comparison of Reactive Robot Chemotaxis. Robotics and Autonomous Systems. 45, 83-97. Ryan, M.A. et al. (2004) Monitoring Space Shuttle air quality using the Jet Propulsion Laboratory electronic nose. IEEE Sensors Journal 4 , 337  347. Vergassola, M. et al. (2007) 'Infotaxis' as a strategy for searching without gradients. Nature 445, 406-409. Webster, D.R. et al. (2001) On the Usefulness of Bilateral Comparison to Tracking Turbulent Chemical Odor Plumes. Limnology and Oceanography 46, 1048-1053.